Like us, we’re sure you watched in horror as Hurricane Florence smashed into the east coast of the United States dumping trillions of gallons of water on North and South Carolina and Virginia. For days, the heavens opened into a waterfall of torrential rains and flooding the likes of which had never been experienced in these areas. Natural disasters the caliber of Florence, force emergency services into immediate action. The emergent nature of the event necessitates a quick reaction by first responders. Spur-of-the-moment evacuation-type ambulance transports happen with great frequency in these kinds of incidents. Although these transports are extremely critical to protect patient safety at the time of the disaster emergency, we find they often do not fit medical necessity criteria or even the origin/destination requirements enforced by the Center for Medicare and Medicaid Services (CMS) for Medicare and Medicaid payment. Even some commercial insurance payers will not recognize these in-the-moment transports for payment. It’s only when the disaster emergency is over and things return to “normal,” that we suddenly realize that it would be helpful to receive reimbursement for all of those extra resources expended to handle the emergency. These types of widescale events include paying staff overtime, additional fuel purchases, lost revenue from daily transport volume and just the overall deviation from whatever the “norm” is for your EMS agency. That’s when the billing office’s phone rings seeking direction on how to recover those costs. Consider right up front that the payer sources may not turn out to be the same payers from whom you normally receive reimbursement. Medicare and Medicaid have allowed exceptions in the past but it takes action by the highest levels of the Federal government to make this happen. Once the President declares a state of emergency for a geographical area then it is possible for CMS to allow for programmatic waivers based on Section 1135 of the Social Security Act. Under Section 1135 or 1812 (f) of the Social Security Act, CMS can issue several “blanket waivers” in the impacted geographical areas where disasters strike. For Florence, President Trump declared the state of emergency almost immediately and subsequently waivers were issued for the States of North Carolina, South Carolina and the Commonwealth of Virginia. The intent of the waivers is to prevent gaps in access to care for patients impacted by the emergency. If a blanket waiver has been issued, then the waiver spells out the healthcare access gap that is covered. If no blanket is issued, providers may still apply for an individual waiver specific to their situation. Unfortunately, no waivers were issued specifically to medical transportation related to Hurricane Florence. Waivers were issued for Skilled Nursing Facilities, Home Health Agencies, Critical Access Hospitals along with a waiver covering the housing of acute care patients in excluded distinct part units of hospitals. 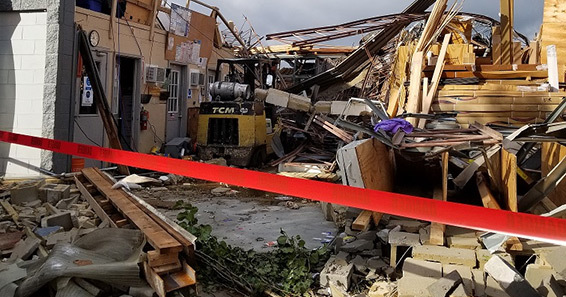 Additional waivers were issued for the care of excluded inpatient psychiatric unit and rehabilitation unit patients in acute care hospital units, emergency durable medical equipment, prosthetics, orthotics and supplies for patients impacted by the disaster. CMS MLN Matters number SE18014 (click here to read) released on September 14, 2018, details the steps to be taken to request an individual waiver when a blanket waiver is not issued for a particular scenario. Thus, if an EMS agency wishes to seek federal reimbursement for disaster-related transports that fall outside of the normal rules and regulations but were forced due to pending danger, the agency can file a request for such an individual waiver. Document. Where have you heard that one before? Be certain that you and your staff have documented the unique circumstances for each and every transport conducted in response to the disaster emergency. Record. Record who requested the trip to be completed. Know the person’s title and role and hopefully you have captured the nature of their original request for ambulance transportation. Collect. Be sure to collect all insurance information, next-of-kin information, facility information and any and all persons that are part of the ambulance run- before, during and after the transport. Where was the patient located upon pick-up? Where did you drop off the patient? What written documentation was provided to you prior to and during transport. Act. Don’t be afraid to file for and request special exceptions wherever possible at all levels. If all else fails and you’re stuck with transports you can’t recover reimbursement for, then consider filing a claim for reimbursement with the Federal Emergency Management Agency (FEMA) and/or your State emergency management agency. There may also be local recovery resources available to you, as well. Home After the Disaster- What to Do Next?